Pecans are the most anti-oxidant rich nut out there and one of my personal favorites. Pecans contain over 19 vitamins and minerals – including vitamin A, vitamin E, folic acid, calcium, magnesium, phosphorus, potassium, several B vitamins and zinc. They are great for weight loss, preventing heart disease and lowering your cholesterol. 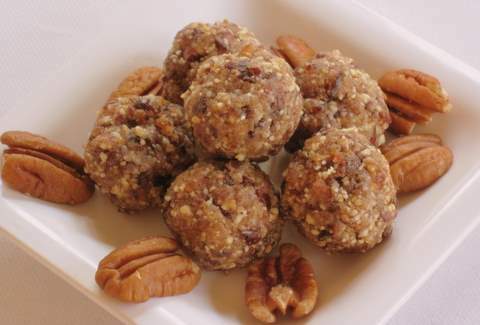 I highly recommend that you incorporate more pecans into your diet with this simple and delicious recipe. It is made with dates. Dates are a fruit native to the Middle East and they are really nature's candy but will not do you harm like other processed sweeteners. Dates are a good source of fiber, calcium, potassium, B-Vitamins, magnesium, protein, and abundance of trace minerals like copper and magnesium I recommend everyone use more dates in their recipes instead of isolated sweeteners like agave, maple syrup, or regular sugar. My latest special report, Your Guide to Sweeteners: What To Consume and What To Avoid tells you the dangers of consuming certain isolated sweeteners and what isolated and whole food sweeteners are more suitable to consume. Enjoy the recipe below. It would be great to make their kids too. Soak pecans and dates for 1-2 hours in water. Drain well and blend together in a food processor or strong blender until it turns into a paste. Use your hands to form paste into bite-size balls. Enjoy immediately or place them in a container for later. They keep well for up to two weeks in the refrigerator. I am really enjoying these recipes and plan on making these as well as the sweet potatoes and lentil stew. Thank you for such good info! Much appreciated!